First-Timers | The Party Planner | Kids VT - small people, big ideas! First birthdays are momentous. I've thrown three, one for each of my girls. The first was a gigantic party for which I made everything myself, down to the construction-paper ladybug hats — no joke! — and invitations for everyone we knew. I've also tried the simple-playdate-with-close-friends approach. After experiencing both, I'd say keep it simple: Rather than striving for perfect ladybug hats, make the goal special memories that you will have forever. Schedule the party around your child's nap and daily routine. I recommend a weekend brunch and festivities that last no more than two hours. Ask attendees to bring a brief letter written to your child in lieu of a gift. Have a decorated box or a special book to put the letters in so the child can read them later in life. If guests read them aloud, have the hankies handy. 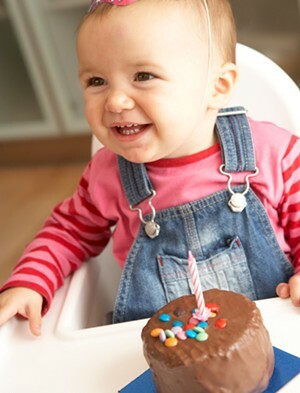 Decide in advance whether to let the little one indulge in classic birthday cake and frosting. Cupcakes are a convenient, small-serving option. Banana or carrot muffins with a slightly sweetened cream-cheese frosting are a delicious, healthy alternative. For entertainment, put together a time capsule for the little one's special day. Among the possible keepsakes: a plaster mold of the child's hands or feet. Pick up a mold kit at a local craft store — both Michaels and Creative Habitat sell kits for $19. The process takes just a few minutes, and it's the perfect party activity. If your 1-year-old has hair, clip a lock to store in a commemorative glass bottle or locket. For the grand finale, bring out the washable paint and a piece of white poster board. Ask attendees to sign the giant birthday card with their handprints.